At a highly anticipated hearing with James Comey, U.S. Sen. John Cornyn spent much of his time questioning the fired former FBI Director about an incident related to the FBI investigation of Hillary Clinton's emails. WASHINGTON – At a historic hearing a month after President Donald Trump fired him as FBI Director, James Comey faced a panel of U.S. senators, including Texas Republican John Cornyn. Over the course of the morning, Comey did not withhold on drama, repeatedly telling the Senate Intelligence Committee that the president of the United States was a liar. When it was Cornyn's turn to ask questions, he called Comey "a good and decent man who's been dealt a very difficult hand, starting back with the Clinton email investigation." His early questions focused on the logic of Trump's firing and its connection to the FBI's investigation into Russian interference in the 2016 election. "If you're trying to make an investigation go away, is firing an FBI director a good way to make that happen?" Cornyn asked. "It doesn't make a lot of sense to me, but I'm obviously, hopelessly biased, given that I'm the one who was fired," Comey replied. That line of questioning mirrored a point Cornyn made last month: That getting rid of Comey was a "lousy way" to "squelch the investigation into Russia." would only magnify the Russian investigation." "All it does is heightens the attention given to the issue," Cornyn said the day after Trump fired Comey. 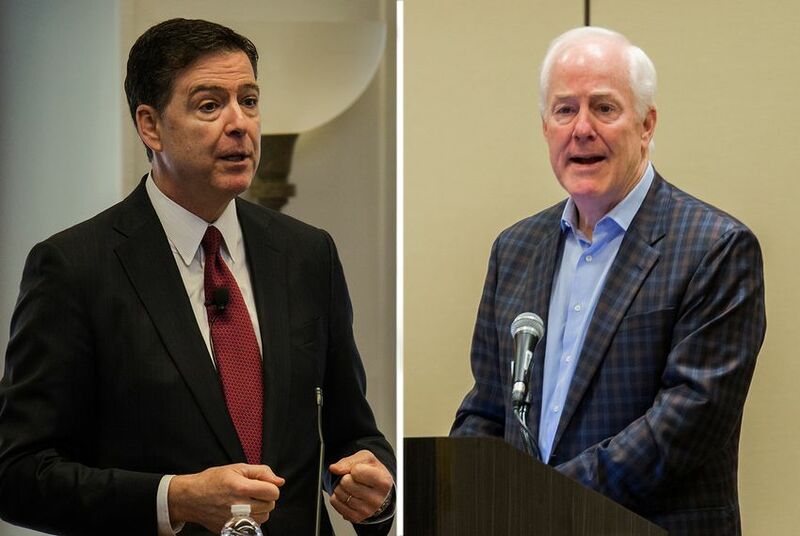 At Thursday's hearing, Cornyn also wondered whether it was reasonable for any president to push an FBI director to publicly announce whether he was under investigation, as Comey has said Trump did. Comey said it was "a reasonable point of view" but warned that it could "boomerang" back on the individual if the investigation status changed. Cornyn spent much of his time at the hearing questioning Comey about a 2016 incident in which former President Bill Clinton spoke with then-Attorney General Loretta Lynch, just as the Justice Department was investigating his wife, former Secretary of State Hillary Clinton, over her use of an unofficial email system. Cornyn is the second-ranking Republican in the Senate and the lone Texan on the Senate Intelligence Committee. Several Texans serve on the House Intelligence Committee, including U.S. Rep. Mike Conaway, a Midland Republican who is leading that chamber's Russian cyberattack investigation. Trump fired Comey on May 9th and suggested a series of evolving reasons for the dismissal. That decision set off a chain of events that eventually resulted in the selection of another former FBI director, Robert Mueller, as a special counsel overseeing the Russia investigation. As Comey testified on Capitol Hill, two other top Texas Republicans – Texas Attorney General Ken Paxton and U.S. Sen. Ted Cruz – were speaking at a conference of social conservatives across town hosted by the Faith and Freedom Coalition. Trump was scheduled to speak at the event soon after. In back-to-back speeches, neither Cruz nor Paxton directly mentioned Comey but seemed to be well aware of the event consuming much of the city's attention. "It's great to be here," Paxton said shortly after taking the stage, "on a day when nothing's happening in D.C."
Cruz called it "a strange time in Washington." "There's a lot of noise. There's a lot of people lighting their hair on fire on cable television every day," he said. Cruz continued: "I've got one simple bit of advice for each of us, for the administration and for the majorities in both houses of Congress, which is ignore the political circus, and let's focusing on delivering results."